Scream! was an anthology kids’ horror comic back in 1984. It only ran for 15 issues before merging with another comic, probably in a scary way. Its short run and shocking stories mean that it sort of lapsed into legend. Monster was reprinted by Rebellion in 2016. It's the story of a kid who discovers his deformed, crazy uncle living in his attic. It was originally written by Alan Moore, and features a concerning amount of murder for a comic aimed at twelve year olds. The second of the big two was The 13th Floor. Maxwell Tower is a highrise tower block, where all functions are managed by a sentient super computer, named Max. Max looks after the residents, and helps them with all aspect of their lives. He plays video games, helps with shopping, arranges repairs, murders debt collectors, organises parties, and tortures petty thieves. Like every friendly AI that we choose to put in charge of our lives, Max is slightly insane. He just wants to protect his residents. And sometimes that means terrorizing people until they die. Max’s method of murder is to transport evil-doers in his lift/elevator to the 13th Floor, a part of the building where nightmares come true. On the 13th Floor, Max can create any environment, using holographic techology that *cough* he has *cough* for some reason. Essentially, the 13th Floor of Maxwell Tower is a holodeck. But with less historical anachronisms and more spiders that want to eat your face. Max is a Crypt Keeper for the 21st century, with the whole set up just an excuse for a bunch of horror images. Glorious, overblown panels of the kind that British kids' comics were producing in the late 70s, appalling parents everywhere. Pages of the type that children love, with adults being eaten by sharks, or pursued by giant bugs. Max does his best to protect his residents, but his actions spiral out of control, and he hurts innocent people. He’s a sympathetic monster – actually doing his best, and driven by love. Even when he hurts people, his residents still love him back. When things go horribly wrong, they assume that Max is the victim and they take his side. It’s disturbing now, 34 years after it was written, when we've actually volunteered to have computers take control of large parts of our lives. Max is just an algorythm, and like the charmingly robotic female voices that we carry around in our pockets or place descretely in the corners of our rooms, they're just doing their best to help us. Misery and destruction are just unexpected byproducts. These 176 pages are just volume one of 13th Floor...but it actually rounds of really well, with a satisfying conclusion. 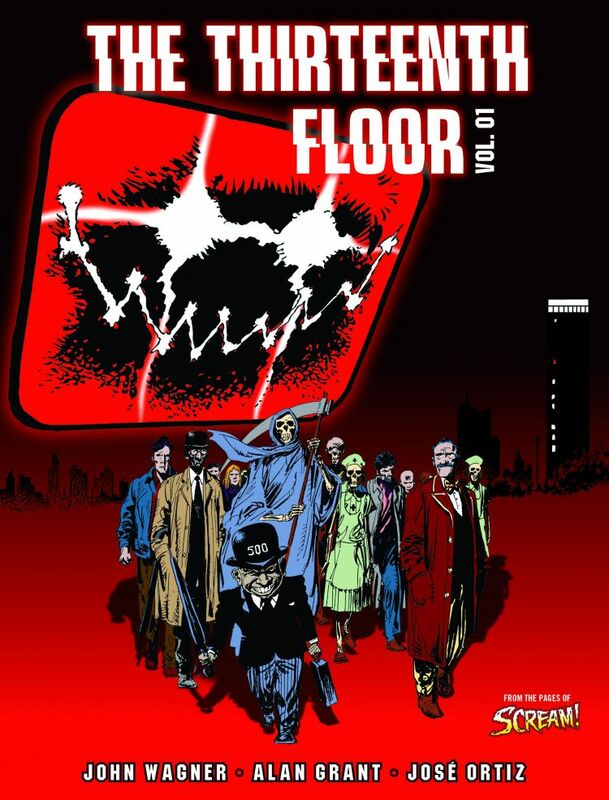 Still, after reading The 13th Floor for the first time, I'm already looking forward to volume 2.